Moonchild Productions has released a relatively major update to its Firefox browser variant for Windows with the release of Pale Moon 24.6 and Pale Moon x64 24.6. Version 24.6 comes with a major overhaul of the graphics rendering engine to boost stability, plus a number of important fixes, including all latest security fixes. It also adds support for animated personas. Because animated personas causes a small -- but noticeable -- performance drop on startup, it’s been disabled by default in Pale Moon 24.6. Users must go to about:config and set LightweightThemes.animation.enabled to true, then reload the persona to switch on animations. The new build’s overhaul of the rendering engine fixes regular crashes that occurred with hardware acceleration enabled on machines with DirectWrite 6.2 or 6.3 (basically Windows 7 with Platform Update installed, plus Windows 8 and 8.1). The problem was most prevalent on systems with NVIDIA graphics cards. A related issue with font rendering -- particularly prevalent on legacy AMD hardware -- has also been resolved. 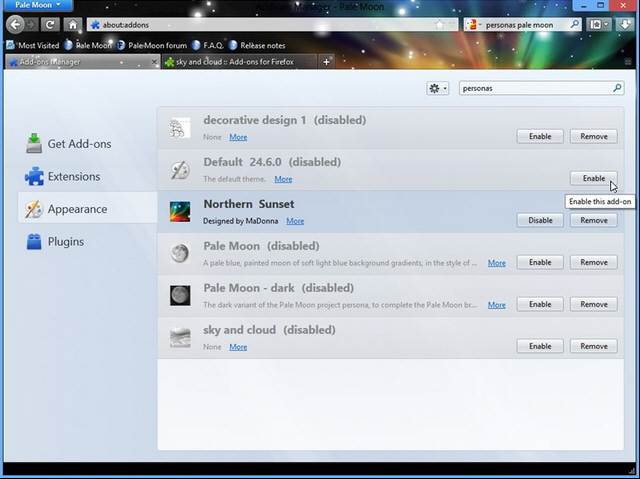 Pale Moon includes two changes that tighten user privacy. The first automatically shuffles the reported plugin installation order to confuse trackers when enumeration is asked for. Pale Moon also now cleans up jumplist icons that may have been left in the jumplist cache folder. This tweak doesn’t just tighten privacy, it also helps clean the user’s hard drive too. Pale Moon has always been built with efficiency and speed over maximum compatibility, which means it enables certain functions disabled in Firefox while removing others. As the version number implies, Pale Moon is no longer simply an optimized build of Firefox, but a completely separate fork. The most recent confirmation of this can be seen with Moonchild’s comment that the new Australis user interface embraced in Firefox 29 is "considered unacceptable" and will not be used. One side-effect of this is that due to Firefox phasing out support for the older version of Sync, Pale Moon will no longer be able to use the Mozilla servers. Moonchild is now providing its own server, and advises users to carefully read the terms of service before using it. Note that despite still being on version 24 -- which helps provide clarity about which Firefox extensions are compatible with Pale Moon, each release includes the most recent security patches found in the main Firefox browser. As a result, Pale Moon 24.6 includes the eight most recently released security fixes for Firefox. A detailed list of fixes and changes, which also include suppressing pop-up status messages when watching full-screen HTML5 video and fixing Windows detection issues in Windows 8.1, can be found at the Pale Moon user forum. Pale Moon 24.6, Pale Moon x64 24.6, Pale Moon Portable 24.6 and Pale Moon Portable x64 24.6 are all available now as open source, free downloads for PCs running Windows XP or later.